Now you're ready to put it all together—and to add a little spice. On this flight, you will file an IFR flight plan, will navigate with both NAV-1 and the ADF (on the IBM versions, ignore the ADF instructions), will encounter crosswinds, and will fly into actual IFR conditions (clouds). Then the weather at your destination will require a major en route adjustment in your flight plan. It won't be an easy flight, but it's very realistic, and I think you'll enjoy the challenge. In any event, it has been broken into separate phases as was Flight 1, so you can work on one leg at a time. Make liberal use of the save and pause functions along the way. The basic flight is shown in Figure 4-11. You'll depart Bradley and proceed direct to the Hartford VOR. You'll have a cross-wind, however, and will have to adjust your heading to offset it and remain on course. From Hartford you'll take Victor Airway 130 to the Norwich VOR, where you'll proceed direct to Block Island, using the Block Island NDB and your ADF. (On the IBM, take up the indicated heading.) The weather will be changing en route, however, as it so often does in reality … but more on that later on. The professional way to fly is on an IFR clearance—on such a clearance, you're in constant radio contact with Air Traffic Control; your flight is constantly monitored on radar; and ATC reserves a corridor of airspace for your flight so you can proceed on course safely, regardless of clouds or low visibility. All airline and other commercial flights go IFR, and most instrument-rated private pilots make it a practice to file IFR most of the time, regardless of the weather. To obtain an IFR clearance, you first get your weather briefing and prepare a flight plan in the usual way, and then you file that plan with ATC, usually by phoning a Flight Service Station. Preparing the Flight Plan. The flight plan form for this flight, included in this phase, was worked out from the New York and Boston Area chart. The first leg is from Bradley to the Hartford VOR, a distance of about 19 miles direct; 19 miles at 2 miles per minute gives you an estimated time en route of 10 minutes. The heading will be around 180°, depending on the departure runway and how the tower routes you from the airport. The second leg, from Hartford to the Norwich VOR, follows Victor 130. The heading is 116° and the distance is 22 miles, for a time en route of about 11 minutes. Leg three, direct from Norwich to Block Island on a heading of 155°, is 31 miles, or about 16 minutes. Filing IFR. Prior to a real departure, you'd phone Flight Service and indicate your intention to file IFR. This is actually just a request for an IFR clearance; the clearance itself would ordinarily be given to you later at the airport, over your COM radio, when you're ready to depart. The particular route and altitude you request may be changed by Air Traffic Control when they issue the clearance, or even later on, during the flight, but if traffic conditions permit they'll usually give you the routing you ask for. Pilot: Bradley Ground, Piper Three Zero Four Six Foxtrot. ATC: Four Six Foxtrot Ground ready to copy? Pilot: Ground Four Six Fox ready. ATC: Piper Three Zero Four Six Foxtrot cleared to Block Island via flight-planned route. Maintain three thousand. Pilot: Ah, that's Four Six Foxtrot cleared to Block Island, flight planned route, at 3000. ATC: Four Six Foxtrot. Roger. Cleared to taxi for Runway 6. Contact Bradley Tower on one two zero point three. So long. Pilot: Thanks, Four Six Fox. Taxi ahead, and call the tower on the way. Pilot: Bradley Tower, Piper Three Zero Four Six Foxtrot. ATC: Four Six Foxtrot cleared for takeoff. Runway 6. Altimeter three zero one zero. Wind zero five eight degrees at four. Visibility five. Maintain runway heading on departure. Complete your checks; note the time off; and go. Expect a handoff to Bradley Approach Control and instructions for a turn after you've established your climb away from the airport. ATC: Four Six Foxtrot contact Bradley Approach on one twenty-five point eight. Good day. Pilot: Four Six Foxtrot. So long. Pilot: Bradley Approach Piper Three Zero Four Six Foxtrot. ATC: Four Six Foxtrot Bradley. Turn right heading one eight six degrees; then direct to Hartford VOR. Climb and maintain three thousand. Pilot: Bradley Four Six Fox. That's zero eight six and three thousand. ATC: Four Six Foxtrot. That heading is one eight six degrees. Repeat one eight six. Please acknowledge. Pilot: Bradley. Roger; that's one eight six degrees. Thank you. Four Six Foxtrot. Begin a shallow right turn and come around to 186°. When you roll out on 186, toggle the NAV-1 bearing to center the needle, and then take up the resulting heading and fly direct to the VOR. When you have a moment, glance at the time off, and then figure your ETA for Hartford—it's 19 miles direct, but add about 5 miles to that to allow for the initial routing from the airport. That's 24 miles at 2 miles per minute, or about 12 minutes from our time off. ATC: Four Six Foxtrot contact Hartford Center on one one niner point five. So long. You're climbing to 3000 and homing on the Hartford VOR as you monitor the DME. The ADF is tuned to Brainard, but only as a backup. When the needle points right, you're passing that NDB and are approaching Hartford. Entering Wind. When you're level at three thousand, and you have NAV-1 centered, go to the Edit Page and enter the following wind conditions. This gives you a crosswind from the left. As a result, you'll be blown gradually to the right of the course, and the NAV-1 needle will begin to drift to the left of center. Correcting for Drift. To offset the crosswind, you'll have to crab a little into the wind—fly with the airplane's nose pointed a little to the left of the course you want to fly over the ground. When the needle has drifted off center, first turn left 20° and intercept the radial again. When the needle is centered again, turn back onto your course—but not to the original heading. Instead, try a heading about 10° left of (less than) your original heading. If the needle still drifts from center after making that heading adjustment, first get back on the radial again, and then try a different drift-correction angle—more or less than 10° degrees, depending on which way the needle moved from center. Preparing for Station Passage. As you approach the Hartford VOR, recall that you now have only one NAV receiver. Think ahead: At station passage, be ready to note and record the ATA. Turn left to 116°; switch NAV-1 to Norwich; set the NAV-1 bearing to 116°; and then get the needle centered on the new radial to Norwich. Station Passage at Hartford. When the DME is almost zero, note the time and write it down as your ATA for leg 1. At zero miles DME, turn left to 116°. Then switch NAV-1 to Norwich (110.00) R-116 and get the needle centered. Wind Correction. The wind is out of the east (090°), so after turning to 116°, you're now headed more into it than before. There's some headwind now, but less of a crosswind. Therefore, the drift-correction angle that worked on the previous leg will now be too much. Try a drift correction of 5°—a heading of 111° instead of 116°. Then make further adjustments to that heading if the needle still won't stay centered. ETA for Norwich. When the NAV-1 needle is staying centered on R-116 to Norwich, figure your ETA for Norwich and note it on the flight plan. Preparation for Third Leg. While you are monitoring the DME as you approach Norwich and are making the transition to leg 3, think ahead to what you'll have to do at station passage. You'll turn right to 155°; at that point the ADF needle will be deflected roughly 45° to the right. That is, your heading as you reach Norwich will be 111°, and the difference between that heading and the heading of 155° to the NDB is 44°, so just before you turn at Norwich, the ADF needle deflection should be just about 45°. Now go to the Edit Page again and change the wind velocity. At 20 Miles DME (From Norwich), expect a handoff. ATC: Four Six Foxtrot contact Quonset Approach on one twenty-one point one. Good day. Pilot: Four Six Fox, thanks and so long. Pilot: Quonset Approach Piper Three Zero Four Six Foxtrot. ATC: Four Six Foxtrot Quonset. We have you ten miles north of Block Island. Maintain three thousand. Weather Change. The expected front is moving in a bit earlier than anticipated, but at the moment there's a calm; enter the following cloud coverage. But don't worry—just do the same things you always do (only don't bother looking up from the panel). ATC: Three Zero Four Six Foxtrot Quonset Approach. Pilot: Quonset Four Six Fox. ATC: Four Six Foxtrot be advised that Block Island is now reporting below minimums. You're cleared direct to Block Island NDB; then turn left heading zero eight six degrees to Martha's Vineyard VOR. Expect to hold east at Borst Intersection. Maintain 3000. Pilot: Quonset Four Six Fox that's Block Island and then left to zero eight six degrees at three thousand O.K. Maybe you should have taken the ferry. Presumably the weather is better at Martha's Vineyard—or if it isn't, at least there you'll have the benefit of an ILS approach. They're probably routing a lot of other flights that way too, however—that's why they said to expect a holding pattern. 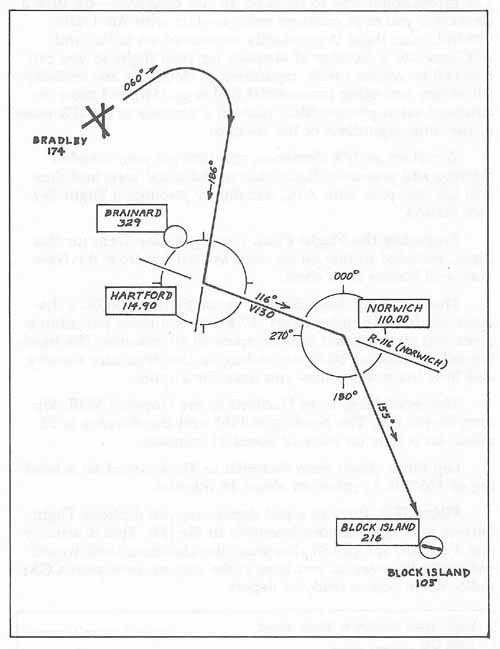 Be prepared: Pull out the approach plate for the ILS to Martha's Vineyard Runway 24 (in Chapter 5), where you'll see the racetrack-shaped oval depicting the prescribed holding pattern at Borst Intersection. Instrument Turn. To make the turn on instruments, use the artificial horizon (between the airspeed indicator and altimeter) as if it were the actual horizon on the windshield. Make your turn very shallow, and be patient. Nudge the stick left a bit, and monitor the artificial horizon, turn indicator, and heading. Keep nudging the stick slightly, as necessary, to maintain a shallow bank as the heading comes slowly around to 086°. Don't fix your attention on just one instrument—learn to scan quickly from one instrument to the next (it takes a bit of practice). Don't forget, as you monitor the artificial horizon, turn indicator, and heading, you also have to watch your altitude; therefore, the altimeter, vertical speed indicator, and airspeed should also be included in your scan. NAV-1 to Martha's Vineyard. When you're established straight and level on heading 086°, switch NAV-1 to Martha's Vineyard (108.20) and set the OBI to 086°. Then get the needle centered. ATC: Four Six Foxtrot. Contact Otis Approach Control on one twenty-four point seven. Good day. Now headed for the Martha's Vineyard VOR on the 086° radial at 3000, you're in contact with Otis Approach, and there's no appreciable wind. You're “in the soup”—you have a way to go, so you have time to think ahead. Your probable routing is shown by Figure 4-12. As you approach Martha's Vineyard, expect to be given radar vectors to intercept the localizer back course. They'll probably have you fly in over the airport on the localizer, and then enter the holding pattern at Borst Intersection. Study the approach plate for the ILS to Runway 24 now, while you have time. Note that Borst is on the localizer, and though it's established by R-312 from the Nantucket VOR (which is not available to you), an alternative fix is 6.8 miles DME from Martha's Vineyard, so the Nantucket VOR isn't required. 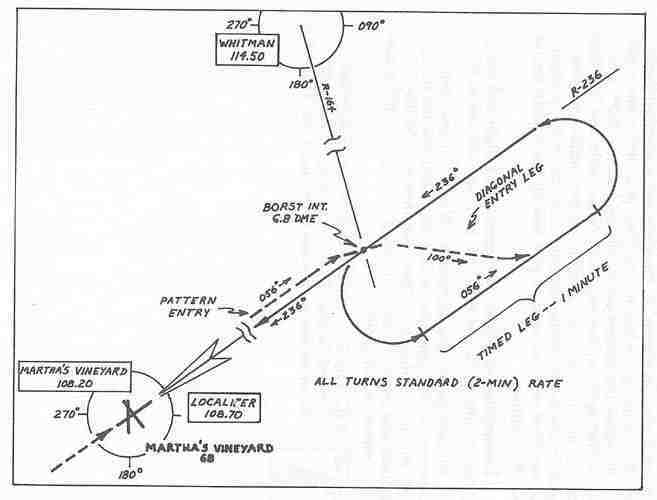 Thus, if ATC routes you inbound to Martha's Vineyard on the localizer heading, as is likely, you'll be at Borst when you pass over the station and the DME reads 6.8; at that point get into the pattern to hold there at Borst until they clear you for an approach—most likely the ILS to 24. At 25 Miles DME, the ATC contacts you. ATC: Four Six Foxtrot Otis. Pilot: Otis, Four Six Foxtrot, go ahead. ATC: Four Six Foxtrot we have you 25 miles west of Martha's Vineyard. Turn right heading one three zero degrees. Descend and maintain two thousand. Expect to hold east on the localizer at Borst Intersection. Pilot: Otis Four Six Fox. That's one three zero degrees and two thousand. Turn right to 130°, using a shallow bank; scan the panel continuously as you do so. After the turn, throttle back and descend to 2000. When Level at 2000 on heading 130°, the ATC contacts you again. ATC: Four Six Foxtrot Otis. Maintain two thousand on heading one three zero degrees to intercept Martha's Vineyard R zero five six, and hold east at Borst Intersection. Expect ILS approach to Vineyard Runway Twenty-four. Pilot: Otis, Four Six Fox. That's present heading to R zero five six and hold east at Borst. Tracking R-056 Inbound. Note that R-056 is the localizer heading. You'll intercept that radial, will track inbound to the station, then will continue outbound to DME 6.8 miles, where you'll hold and wait for further clearance. Toggle NAV-1 to R-056; when the needle is about centered, turn left to 056° and track inbound. Frequency Change Inbound at 5 Miles DME. When you are still headed inbound and are about 5 miles DME from the VOR, be sure the NAV-1 needle is centered. Then switch NAV-1 to the localizer frequency (108.70); leave the bearing at 056° for now, as you proceed inbound on that heading. Be aware that you're now actually on the back course, so interpret the NAV-1 needle accordingly. Weather Change. When you're established on the localizer with the needle centered, arrange for a further deterioration in the weather. Enter the following cloud information. Set-Up. Now would be a good time to slow down and get set up for the approach. After station passage, you'll continue outbound on heading 056°, to 6.8 miles DME. The airplane is set up at approach speed. Localizer Bearing. Later, when you're cleared to land, your inbound heading on the ILS approach will be 236°; change the NAV-1 OBI bearing to 236 now, so you'll have the heading there as a reminder. Remember that right now, as you proceed outbound from the station, you're going the “wrong way” on the localizer, so interpret the needle accordingly. Now pause the program, and consider the procedure for holding. The Holding Pattern. 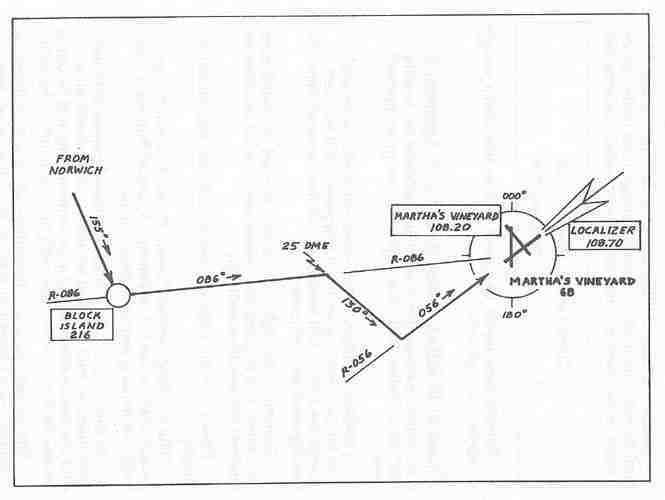 Consult Figure 4-13 and the approach plate for the ILS to Martha's Vineyard Runway 24, and study the holding pattern at Borst Intersection. As shown, you'll fly a racetrack-shaped pattern with left-hand turns, so your inbound leg will be along the localizer with the needle centered and your outbound leg will be out to the east of the localizer beam with the needle off to the right. The straight portion of the outbound leg will be flown for 1 minute, and all turns will made at the full standard rate. Pattern Entry. To enter the pattern so that you're making left-hand turns, as shown on the plate, use a teardrop entry: First fly out along the localizer to Borst (6.8 DME); turn right and fly across the pattern diagonally on heading 100°; turn left to 056° again on the remainder of the outbound leg. Then you can turn left and come back in on the localizer to Borst again, to begin the regular pattern. Once you're in the regular pattern, time each outbound leg so you fly the straight leg for exactly 1 minute. Resumption of Flight. Now resume the flight and make several circuits of the pattern, until you have the feel of it. At some point, Otis Approach will call you and issue a clearance for the approach. At that time, continue the pattern until you arrive inbound at Borst, but then stay on the localizer and begin the descent, using the standard ILS procedures shown on the plate. ATC: Four Six Foxtrot cleared for the ILS approach Vinyard Runway Twenty-four. Contact Vineyard Tower on one twenty-one point four. Have a nice day.